Time: too ad hoc, too inflexible, insufficient. In planning CPD, it’s obviously important to consider the time constraints. When are teachers given the opportunity to attend workshops or courses? When are they going to be able to discuss ideas with each other? When will they be able to report back on their initial actions? If you don’t have a structured timetable for CPD sessions across the year, ideas won’t take root. On any given INSET day, teachers are often overly managed – they need time for themselves and their teams to absorb ideas and plan their next steps. Teachers should be trusted to use free time as they need to. With time-intensive processes like Lesson Study, the time has to be found and lessons covered if necessary; you can’t expect these structures to flourish if they rely entirely on teachers using their free periods. My school has seven INSET days; we feel we can justify that. Why do so many schools only have five? Who says you can’t have more and what would they do about it? Although excellent CPD can flow from teachers working in groups sharing ideas, it can be problematic if the groups don’t have people in them who can drive things forward, offering challenge and/or contemporary knowledge of the issues at hand. I’ve seen situations where teachers are simply recycling half-learned snippets of information, for example quoting weird out of date distillations of the ideas of Claxton, Hattie or Wiliam; where they are promoting ideas that have been debunked for years – or where they’ve been unable to use an hour’s meeting effectively without significant guidance, because of a lack of understanding of the problems or the capacity to provide solutions. It’s really important that self-directed CPD groups have the tools to function effectively otherwise the time is wasted and bad ideas are propagated. A key job of a Head or CPD leader is to make sure that any CPD is being led by people with the required expertise. Who in your school has the most up-to-date pedagogical expertise? Who is reading the books and engaging with research? This is the classic ‘visiting speaker’ pitfall. A lot of school leaders fret about the need to ‘get someone in to inspire my staff’ for an INSET day – but fail to plan any process for following the ideas through. Six months down the line – what happened to all that motivational buzz from all those inspiring ideas? Often the answer is ‘nothing’. This can apply to lots of other CPD events too. Without a follow-up process, CPD events are likely to have a very short-term effect if any. It’s much better to plan a sequence: Input; follow-up 1; follow-up 2 – so that from the start, everyone knows that the CPD is a process, not an event. I’ve explored this idea more extensively in my plantation vs rainforest post. Still too much teacher CPD involves the whole staff attending compulsory sessions for everyone at once. This is problematic on many levels. Given the diverse needs and interests of any group of teachers, it is highly unlikely that they all need to receive the same professional development. Forcing everyone to have the same inputs breeds resentment and resistance from people who feel they’d rather be learning about something else. Given the limits of time across the year, teachers should be given opportunities for CPD to be tailored to their needs. If people have chosen to engage with something, it’s far more likely that they will act on the input to influence their teaching. ‘Whole school initiatives’ can be problematic here. Yes, we want everyone to work on literacy – but that still doesn’t necessarily suggest the best way to take things forward is for everyone to hear the same talk. Good CPD programmes consist of a range of workshops and courses that people can opt into – or have recommended to them – according to their needs. Fundamentally this is about fostering a culture of professional trust where quality takes many forms – it is fine for different people to do things different ways. One Head at the SWAT conference told me this was a ‘lightbulb’ moment – it had never occurred to him before that CPD could/should be tailored to individuals and all his school CPD involved getting the whole staff together in one place every time. Time for CPD is precious so it’s important to use the time wisely. There is a danger in wasting time on superficial matters that are unlikely to change practice. I can think of several ‘training sessions’ that I’ve sat in where I questioned why we were doing it at all – where it seemed we were only there to humour the speaker who’d taken the trouble to come in. What if the best use of time would be for a team of colleagues in a department to sit together to plan a set of lessons or assessments, or discuss their subject knowledge for a particular topic – instead of sitting in the hall listening to more input. I think the input on INSET days should be lean – so that people have time to work on the ideas and put them into practice. Normally, people are itching to get on with things – so let them. All too often I’ve heard teachers tell me ‘I’d like to do that but my Head of Department won’t let me’. Or it could be the Headteacher telling me ‘if only we could get away with that’. If you probe a little, invariably this is because of their anxiety around OfSTED compliance. Too much CPD is built around the demands of the inspection regime and the process of presenting the school to inspectors when they arrive. The truth is that outcomes drive inspections these days to a massive extent – and truly great student outcomes are driven by excellent routine practice. Any training that improves practice IS preparing for OfSTED. Surely? At the same time, you get a lot more buy-in and momentum – more actual change in classroom practice – if a CPD process is driven from an internal ground-swell; an intrinsic sense of purpose, rather than a top-down directive. Of course OfSTED matters – but not to the extent that it dictates the CPD agenda for every teacher; that’s the wrong way around. I think that is especially relevant with changes to performance measures; schools that have relied on Y11 intervention strategies to get through the hoops will become unstuck unless something much deeper is going on. Often it’s a lack of incentive that cause the blockers to roll their eyes. Why do I have to do this thing exactly? It is great to have people in a school who bring in new ideas and are enthusiastic about trying things. BUT, it is all too easy to be dazzled by bright new shiny things – the latest fad or gizmo that is going to change everything. Teachers are often deeply resistant to being sold things – it happens too often; they’ve learned to be cautious. It is a giant cringe to listen to someone rave about their new idea when they appear to be all Enthusiasm and no Substance. 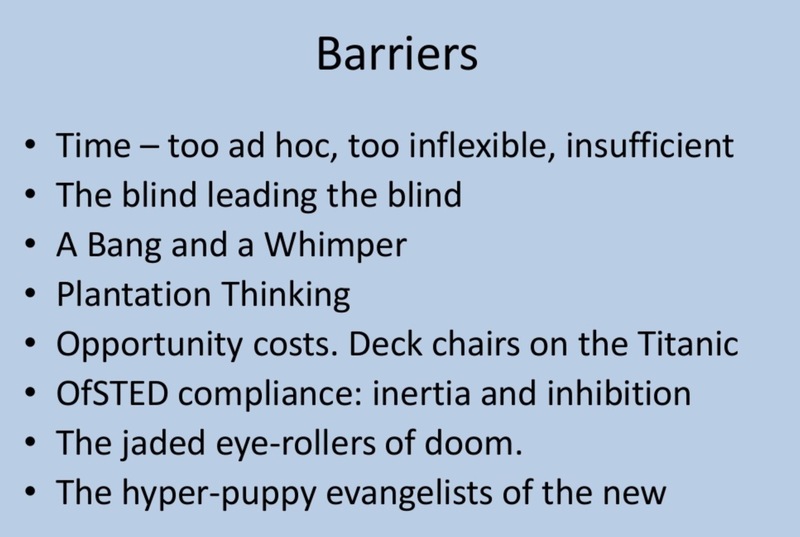 In truth, the eye-rollers of doom are normally people who’ve been burned by too many hyper-puppy evangelists. If you have a great idea, you need to sell it carefully. Just because you like this idea, why should I have to do it too? It is often better to start with an interest group – volunteer pioneers who trial a new idea and then share the thinking across the school. For example, Edmodo is taking off at my school. Slowly. We’ve never done a whole school CPD session on it or actually any formal session. People have shared their ideas through our CPD marketplace and have set up ad hoc meetings for interested parties. If we’d ever told people that this is THE THING – they’d have run a mile. New isn’t necessarily Good – but you still need to try things. At KEGS we’re getting better at sharing the fact that some ideas don’t work as well as we’d expected. If your boss wants you to prove something has worked – you’re going to find a way to show that. If, on the other hand, you are simply encouraged to measure impact honestly and openly without prejudice, that’s a different thing altogether. The talk I gave goes on to describe the research-engaged culture that we’ve been trying to develop at KEGS, alongside explorations with Lesson Study and our Departmental Review system. It all links together. Maintain an unwavering focus on pupil learning. The penultimate point is something I am particularly keen on and speaks to your point about the visually-impaired, etc. It’s not just about being abreast of the latest thoughts on educational research (which is vital) but also being effective as a professional coach. How do you establish trust and credibility? Elicit teachers’ misunderstandings in a sensitive way? Support their confidence whilst challenging flawed thinking? How do you facilitate a culture of reflective practice, once you have gone? This is not ‘training’, and we do not ‘deliver’ CPD… these things are important. This is about how the professionalism of teaching will be defined. Your principles are very sound. I’ll check out the prezi. Thanks. This is really interesting. I am doing a presentation on Edmodo this Monday and have realised that I may end up coming over as a bit of a puppy as I really enjoy using it and so will fall into the over enthusiastic trap. If you have any more detailed advice on how trialling it has worked for you that would be really appreciated. Like you I am going to start it up with a small T&L group to allow them to experiment with it but any other pointers would be great. Hi. Simply being aware of the risk of appearing over-enthusiastic is a start. I find this difficult myself. With Edmodo – or any tech – I’d say it’s helpful to show what it can do but also point out some pitfalls; no platform is perfect but it’s a question of finding the most helpful applications. At KEGS about 8 different teachers have used it in different subjects; we all have found different features to be helpful. If you set people going and arrange a gathering after a term to share experiences it will help sustain the interest and the spirit of enquiry. I’d never suggest that anyone must use it – always leave it as an option. Reading what you have written just makes it all sound like common sense! We expect staff to personalise the work for pupils, why wouldn’t we personalise the training for staff? Really enjoyed the post, thanks very much! Thank you. I can remember when as a young teacher, some of the older teachers appeared so negative at – I can’t remember what we called staff development forty-five years ago. When an “old teacher” myself, I tried really hard to be positive and up-beat and would have loved some of the ideas in your post to have been implemented.